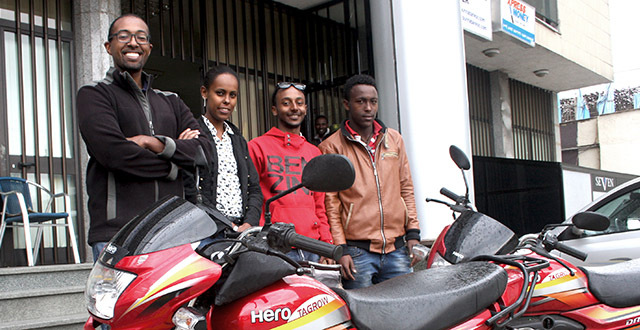 Over the last 12 months, there’s been a bit of a race among a number of entrepreneurs to establish a home food delivery business in Addis Ababa. The number of people and investors wanting to enter into this sector of Addis’ booming restaurant scene (I know of three already), really does speak volumes for the potential within this market, and bodes well for those among us in search of take-away! One businessman who’s leading the race is Feleg Tsegaye – founder of Deliver Addis, which launched in early 2015. Deliver Addis is an online platform through which you can place an order with a number of partner restaurants and have food delivered to a chosen address within an hour. I have a feeling that over the next year, the home food delivery industry in Addis will really push boundaries and change expectations around cuisine, eating out and customer service – I for one am looking forward to seeing where it goes! Visit http://www.deliveraddis.com to find out more about Deliver Addis. What has the journey been like from concept to launch of Deliver Addis? The concept came to me a few years ago when working as an IT consultant in Addis – I don’t like cooking, was working long hours and having been brought up in the USA, I was used to being able to order takeaway food – I couldn’t see any reason why this couldn’t work in Addis Ababa. In March 2014 I set up a small private pilot, with a quick website and a few restaurants on board. I tried the concept out on friends and their networks; I needed to be sure that the concept of home delivery could work in Addis. The pilot helped me to build data around the average order amount and frequency of orders, so I had something to go to investors with. One day I was talking to one of my clients about this project, and they loved the idea. They subsequently become investors in Deliver Addis. With their financial input and my IT background, we were able to scale up from a basic concept to a public launch. We launched a year after the pilot in March 2015. Can you tell me about the team behind Deliver Addis? We’re only six months old, so our team is small and evolving. At the moment it consists of myself and several others from different backgrounds including IT, HR, management and logistics. We also count the investors as part of the team, albeit silent ones! What have been the challenges and surprise successes since opening? I think it’s fair to say every start-up encounters challenges, and Deliver Addis has been no exception. One of our main challenges (which I’m sure everyone will expect) is finding customers. Addis is notorious for having no formal address system and streets tend to have both formal and informal names. We get around this by customers registering their delivery locations with GPS when they create an account, but nevertheless, we’ve had customers register their location on the wrong side of town, then provide incorrect additional information and a wrong phone number. Map reading isn’t second nature to many people, so pinning your location on a map can be a huge challenge – we have incorporated geolocation to the system now to find a customers position automatically where possible. Other challenges include the safety of our motorbike drivers on Addis roads (especially in the rainy season) and technology. Our business depends on an active phone and internet network, and there are times when one or both will go down. If this happens across the whole city, there’s little we can do and no one can place orders anyway. If it’s a localised outage however, we have to relocate the team to a back-up office in another area of Addis to ensure we’re receiving orders and can deliver. The surprise successes, are less of a surprise, more of a relief – it works. People are ordering, restaurants are contacting us to become partners and we’re reaching the targets we set ourselves for our first six to 12 months of operation. How did Deliver Addis decide on the current eight restaurants listed, to be your first partners? I started by being a customer at each partner restaurant to find out if their staff are attentive, if they can turn around orders quickly, if the owners are actively engaged and if they offer take-away. There are so many new restaurants opening in Addis, and many of them are top quality, gourmet food. This doesn’t necessarily work for home delivery though, so the cuisine has to be right. With so many new restaurants, and with our brand becoming better known, we’re now getting approached by restaurants to become partners – I’ll try every one of them myself first, and they won’t all be appropriate, but I look forward to expanding the portfolio, not least because I created this business for myself, to be able to get good take-away. As a regular customer, I’m excited to see what new things I can order over the coming months. How do your drivers manage to find every house and office within a constantly changing city? As I mentioned before we use GPS – it’s the only option in Addis. When someone registers for an account, they can list a number of different addresses: home, work, friends etc. They can then add notes to help the driver, along with a phone number. Our drivers have been trained to provide excellent customer service, and always do everything they can to find every customer. How important is it for Deliver Addis to include a mix of Ethiopian and Western foods for customers? A number of our partner restaurants do a mix of Ethiopian and Western food, making both available to customers. Interestingly though, Ethiopians can be very particular about their food. Shiro for example should be served bubbling in its pot, so turning up with Shiro that’s been travelling for 20 minutes just doesn’t work. I think it’s also fair to say that Ethiopian cuisine is quite tricky to transport – wot is generally liquid based which is prone to spilling on a motorbike if the restaurant doesn’t have appropriate packaging. What can customers expect from Deliver Addis over the next 12 months? Someone in this business has to be a big food lover! If you could eat anywhere in the world, where would it be? There is one place I’ve been intrigued about ever since seeing it on a programme – Noma, in Copenhagen. I don’t even know if I’d like the food, but the experimental approach they take with locally sourced ingredients is intriguing and would be quite an experience to try! Fundraising and Communications consultant living in Addis, who's keen to get involved in lots of amazing projects! I love reading, photography, exploring, coffee, running, food (especially cheese), working from home and having a dog.